NYC is Blue: Empire of Soccer: "Favorable returns for NYCFC after Stadium Town Hall"
Empire of Soccer: "Favorable returns for NYCFC after Stadium Town Hall"
Opposition for a new soccer stadium in the South Bronx was vocal at a town hall held earlier this month, but returns prove there was a silent majority present. News 12 in the Bronx caught up with Bronx BID Executive Director Cary Goodman who revealed the results of a town hall survey. 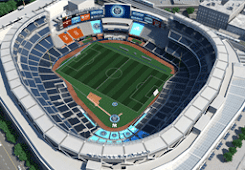 “Three out of four people would like to see a soccer stadium built,” Goodman told News 12. The survey questioned attendees about the stadium proposal and their position. In order to get a better scope of interest and credibility, it also asked whether or not participants were local residents. The key question discussed in this report asked “DO YOU THINK A SOCCER STADIUM IS A GOOD IDEA FOR RIVER AVENUE?” To that, NYCFC saw impressive backing from the local community. While the support is impressive, the opposition’s resolve seems equally so. Asked if their opinion would change about the stadium if it received no public funds, only one in five surveyed said they would consider the proposal. The next salvo in this debate will come from NYCFC’s corner, with a town hall of their own planned in the coming months. That's very good news indeed. The original meme coming out of the meeting was overwhelming community opposition based on a very few and very loud opponents, which wasn't helped by Empire of Soccer running their coverage under a headline like "New York City F.C. Stadium Town Hall Turns Ugly". Plenty of other media picked up the headline and ran with it—especially on social media—to the point where a casual observer could have been forgiven for thinking that the entire South Bronx was in an uproar over the very thought.